Jennifer Doudna is the 2017 recipient of the Carl Sagan Prize for Science Popularization. Jennifer Anne Doudna is a Professor of Chemistry and of Molecular and Cell Biology at the Department of Chemistry and Chemical Engineering of the University of California, Berkeley. She has been an investigator with the Howard Hughes Medical Institute (HHMI) since 1997. 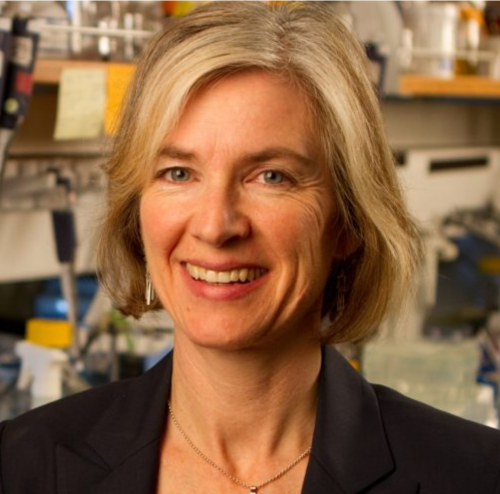 Doudna has been a leading figure in what is often referred to as the “CRISPR Revolution” for her early fundamental work and ongoing leadership in the development of CRISPR-mediated genome editing. In their seminal 2012 paper A programmable dual-RNA-guided DNA endonuclease in adaptive bacterial immunity, Doudna and Emmanuelle Charpentier were the first to propose that CRISPR/Cas9 could be used for programmable gene editing, an idea that has since been further developed by many research groups for applications ranging from fundamental protein research to treatments for diseases including sickle cell anemia, cystic fibrosis, Huntington’s disease, and HIV. Doudna has been widely acclaimed by the scientific community for her fundamental contributions to the field of biochemistry, receiving many prestigious awards and fellowships. She has also been recognized outside of the scientific community, being named one of the Time 100 most influential people in 2015 (with Charpentier) and listed as a runner-up for Time Person of the Year in 2016 alongside other CRISPR researchers.